A rendering of the first phase of the Millenia office area. Construction will begin soon on the first offices in the 210-acre Millenia development in Chula Vista near the Mexican Border. Chesnut Properties, which has developed R&D facilities and office buildings throughout San Diego, announced Wednesday it has purchased seven acres in Millenia’s designated office area, with an option to purchase the balance of the 28-acre office site. 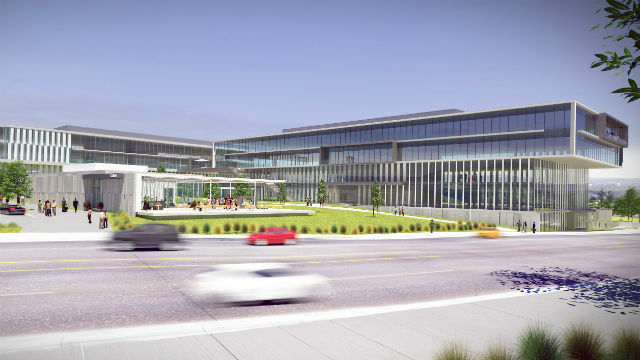 Grading has begun for two four-story office buildings, totaling 318,000 square feet, a parking structure for 1,200 vehicles and a 7,000-square-foot fitness center and cafe complex. The first phase will also include a 40,000-square-foot Chula Vista library branch. Millenia is envisioned as a future city center for South San Diego, with up to 3,000 multi-family residences, 2 million square feet of office space, 1.5 million square feet of retail space, six themed urban parks and a variety of tree-lined promenades, casual gathering places, and plazas. Population at build out will be approximately 7,500. The multi-billion-dollar development by Meridian Development for Stratford Land is estimated to take 20 years to complete.